So you’re tired of looking at those faded out, dulled finished brass exterior light fixtures, but can’t afford to replace them and don’t want to continue to look at them. Well there is an alternative solution. The “Refinishing Brass Exterior Light Fixtures Ebook” will show you how to refinish your exterior light fixtures to a beautiful new look without breaking your checkbook and requiring an inordinate amount of time and effort. 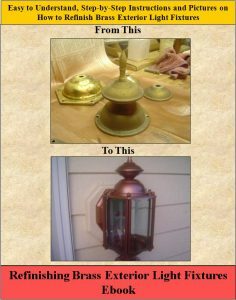 The “Refinishing Brass Exterior Light Fixtures Ebook” from HomeAdditionPlus.com will help you to refinish your exterior lights to a like-new condition with simple to follow and easy-to-use instructions! Pictures are included in every step of the process! Order Now and Immediately Download the Refinishing Brass Exterior Light Fixtures Ebook today! The Refinishing Brass Exterior Light Fixtures EBook costs only $15 and is 100% guaranteed.